it’s not all winter sewing around these parts. in fact several weeks ago i brought home a fabric haul to start my spring sewing. most of it was for my daughter (which i already sewed up and hope to get photographed some day…) but i picked up a couple things for myself. the first of which is this cute floral lawn/voile. it was marked on the roll as liberty of london fabric, however i’m pretty sure it is not. it’s a nice quality fabric, don’t get me wrong, but it doesn’t have that swoon-worthy feel i would have expected from liberty. not that i would know, since i’ve never felt any before. soon though, soon… yesterday i splurged and ordered some of the real deal. ya know, for research. and hopefully a cute spring/easter dress. this fabric was $13/yd, so even though it’s on the higher end of my price-per-yard comfort zone, i only needed a small amount to make a scout tee. i’ve searched high and low for this print online, but alas i’ve come up blank. but, liberty or not (probably not), i love the print! 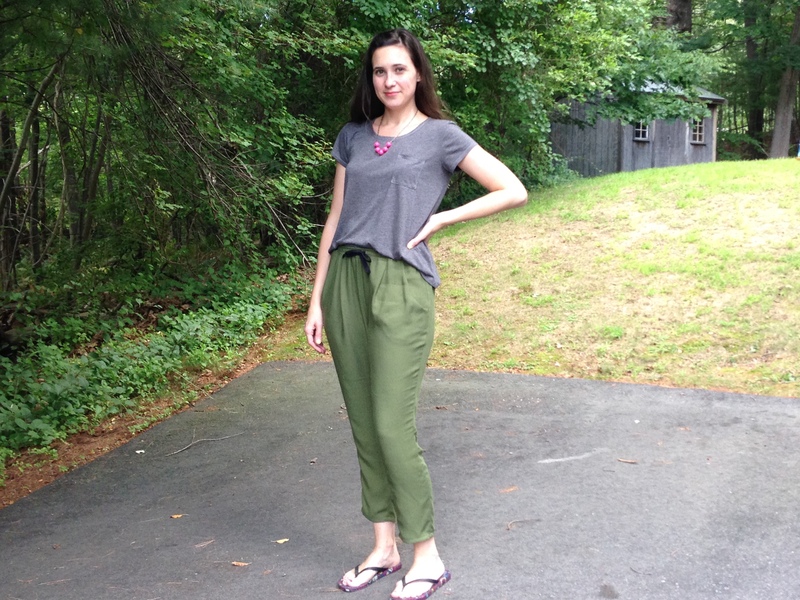 i’ve already made the scout tee a couple times (as most likely you have also), and it’s such a fast and easy pattern. seriously. i heart it so much. 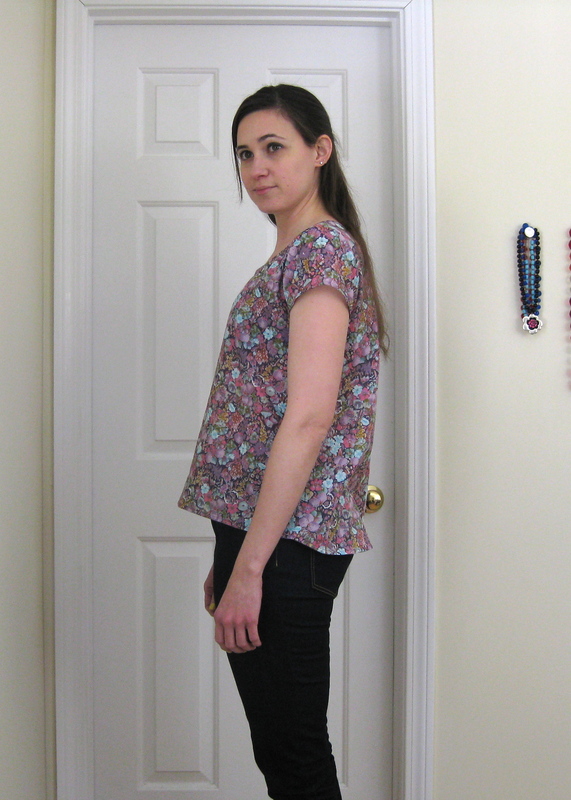 i previously altered the fit with a SBA, widened the hip, and dropped the back hemline. i think i still need to make a couple adjustments though. the back pulls slightly and the front gapes a little. 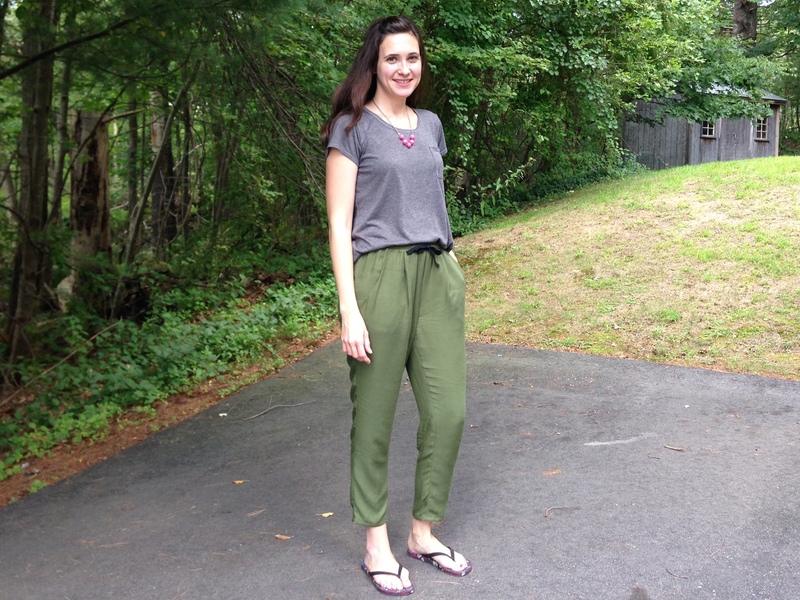 i didn’t notice it so much on my silk scout, but when i throw a cardigan over this one, the fit issue becomes more obvious. i think next time i’m going to add width to CB, and remove the same amount from CF, then re-draw the neckline as necessary. there may be a better way of handling this, but whatever. i still love this tee! 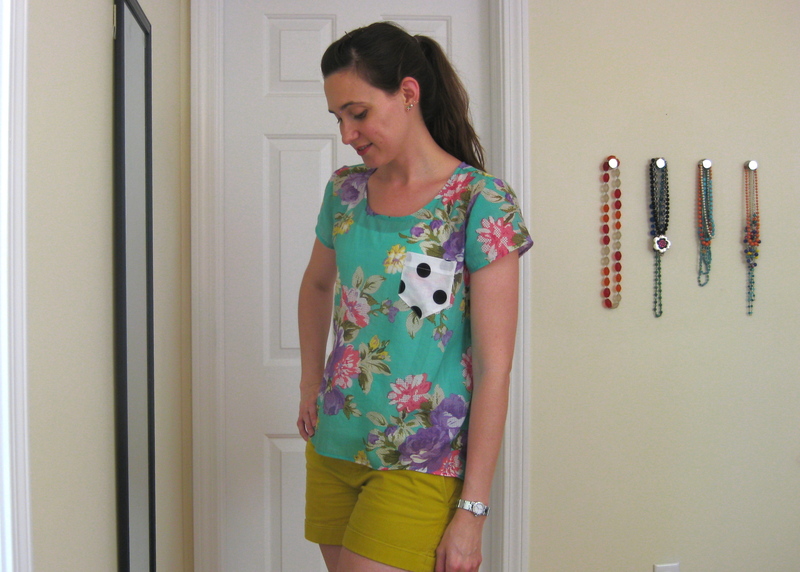 not long ago jen over at grainline studio posted a tutorial on how to make the ever-popular scout tee with longer sleeves. i had just bought a nice cut of silk specifically for a scout tee, so i decided to give it a try. turns out, it’s pretty easy to do! so yeah, silk! 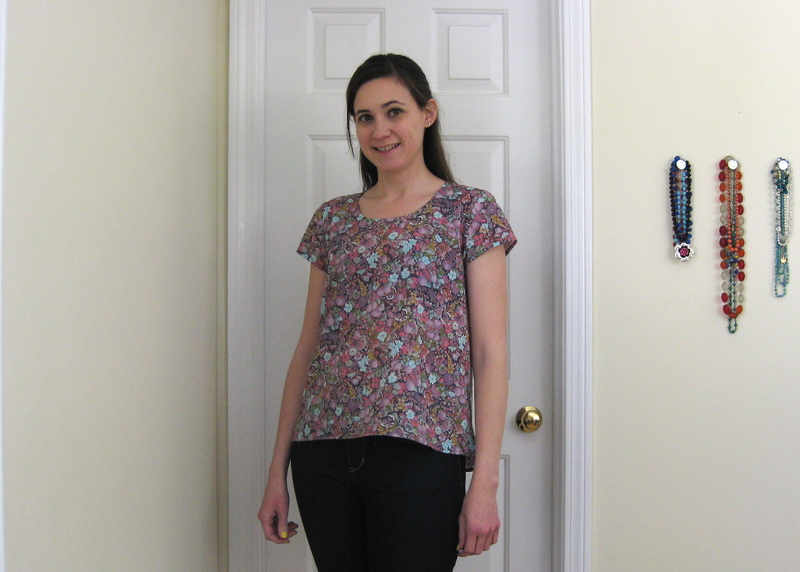 this is the second blouse i’ve made in the last few weeks in silk, but i’m posting this one first because it’s a simpler design and i thought people might be curious about the longer sleeve adaptation. i don’t know if this is a particular type of silk, it’s er… silky, smooth, and appears to have a plain weave (as opposed to a crepe de chine, which is more textured—that is the limit of my knowledge of silks). since my first attempt at using silk went so well i was pretty confident to cut into this. to pretreat my fabric, i washed it on cold on the hand wash cycle, then line dried. it dries in about two seconds, so that’s pretty cool. 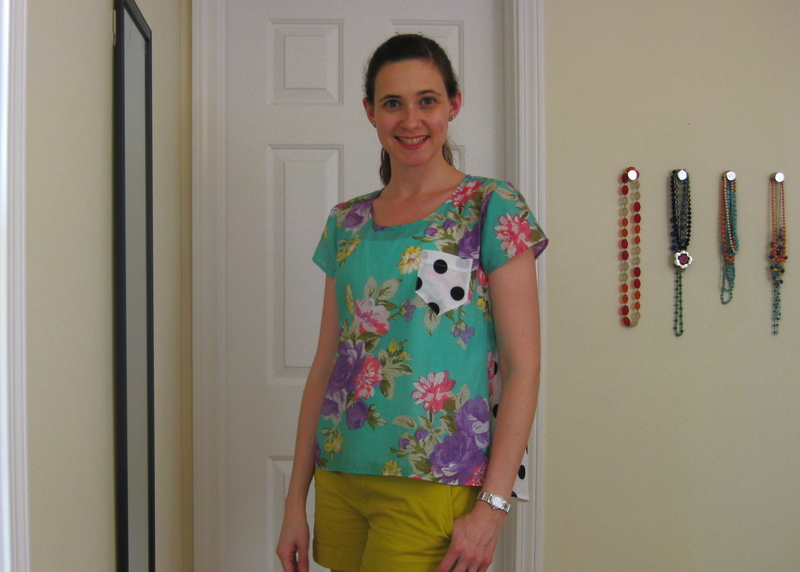 i made my sleeve to have about a 12″ finished length from underarm to hem. the width of the sleeve hem is 12 1/2″ which i lightly gathered onto a 10 3/8″ long cuff/binding (i wrapped a measuring tape around my arm to determine how big i needed the cuff). the only thing i did differently than jen’s tutorial was to swoop the hemline up at the underarm seam by 1/2″ to keep it from being super slanty on my arm. 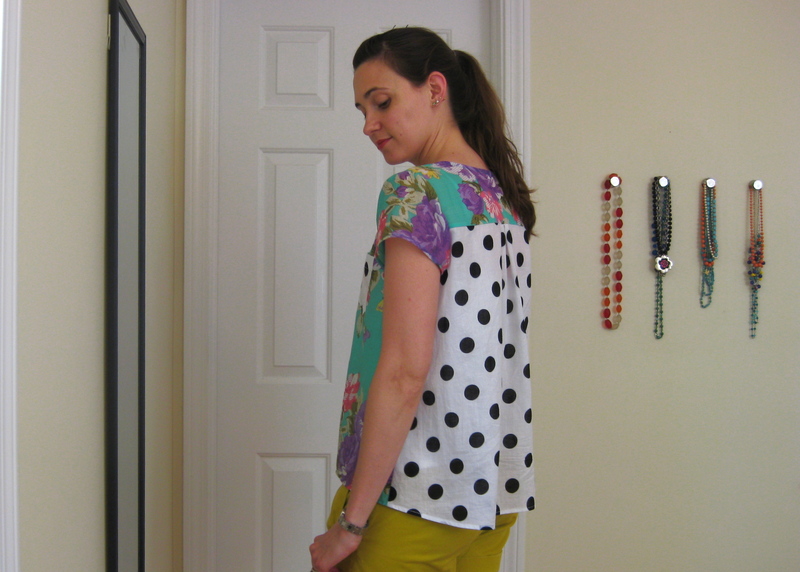 the longest part of the “swoop” should be about 1/3 of the way in from the back underarm seam. 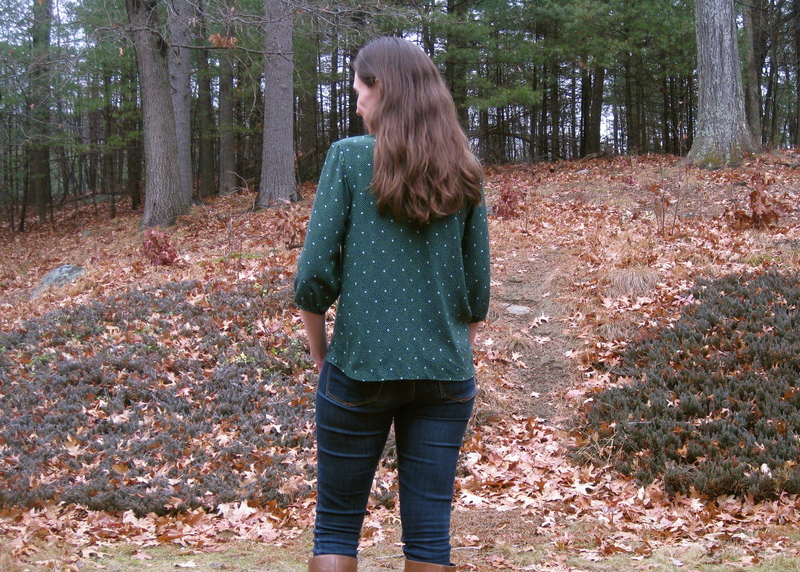 the last time i made a scout tee i changed it up to have a yoke and a swingy back. this time around i left everything per the pattern (shocking!). 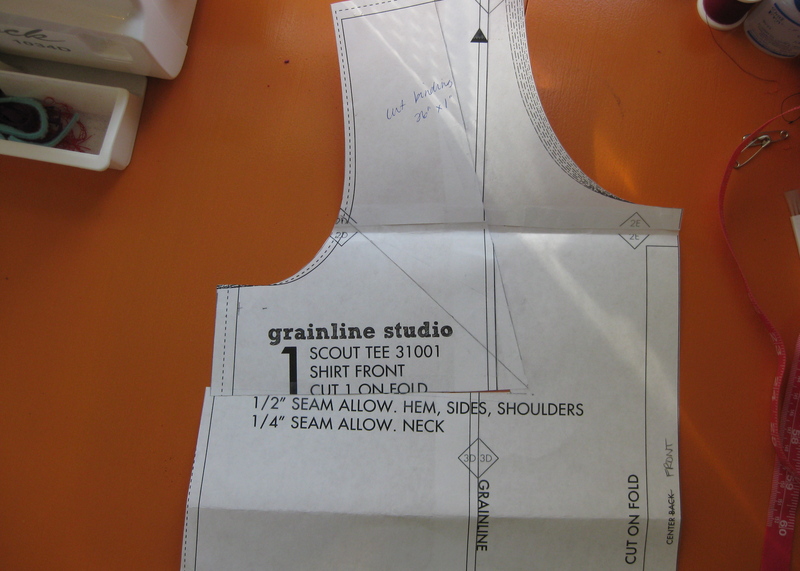 i made a size 4 at bust, graded out to a 6, then slashed and spread to get the hemline out to a 10 (front and back pieces). and i dropped the back hem by 1″ cuz i like-a-de bum coverage. 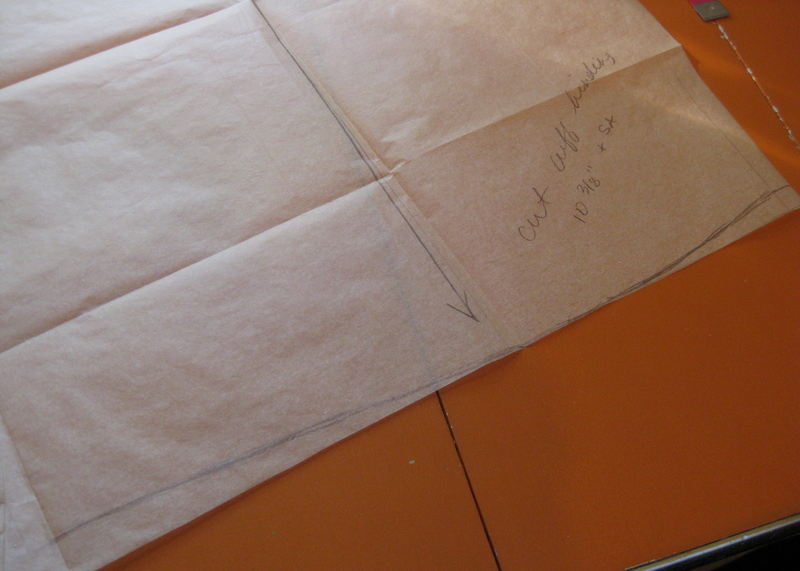 i trued up the side seam when i cut my fabric. i am thrilled with how this came out! the fit is basically perfect, and i love the sleeve length. 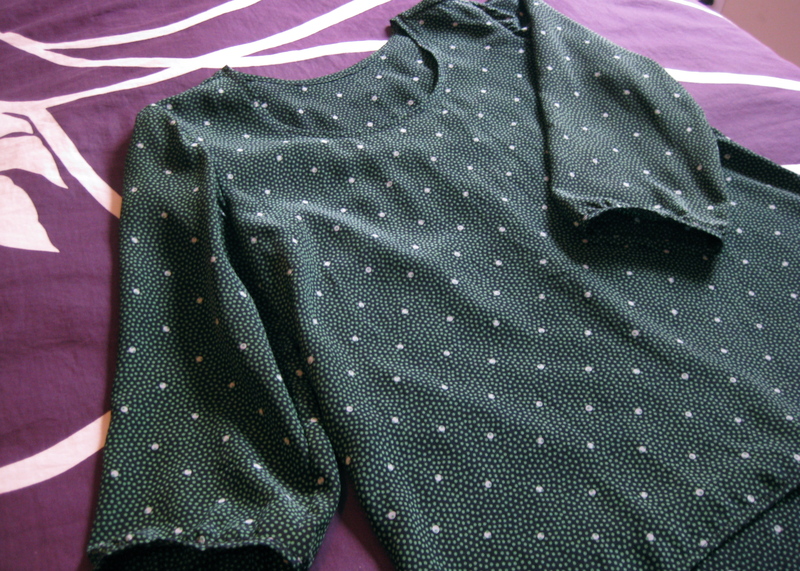 since my fabric is more winter-y in color (the background color is dark navy), having sleeves was a no-brainer. and wow, i am totally team silk now. 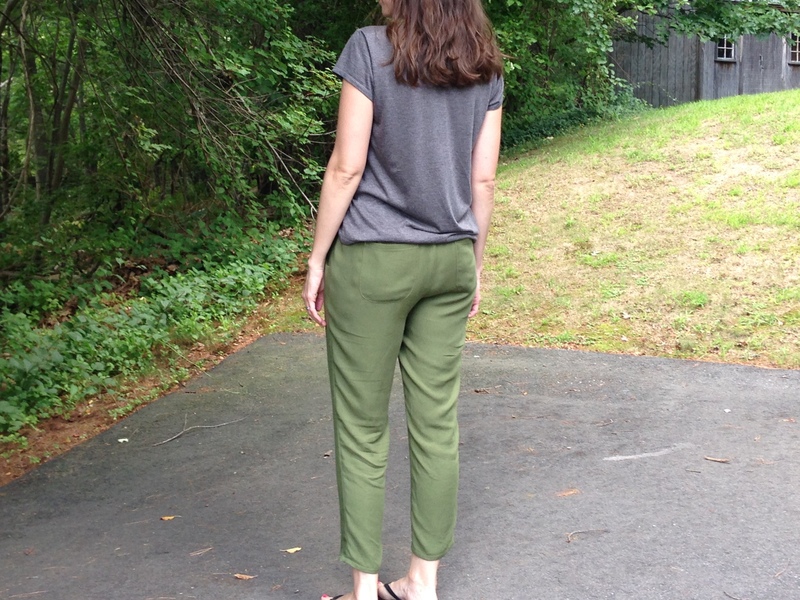 as much as i love rayons for their drape and fun prints, the wrinkle factor drives me mad! i picked up this silk for $12.99/yd at fabric basement (local). what a steal! i usually don’t bother looking at the silks. in fact i was by the rayons when i touched this bolt of fabric, looked at the content/price, then clutched it with my dear life! the cutting lady said the fabric was bolted (instead of on rolls) by mistake. had it been with the silks i never would have laid eyes on it. you can bet i’ll be perusing the silk section from now on. p.s. 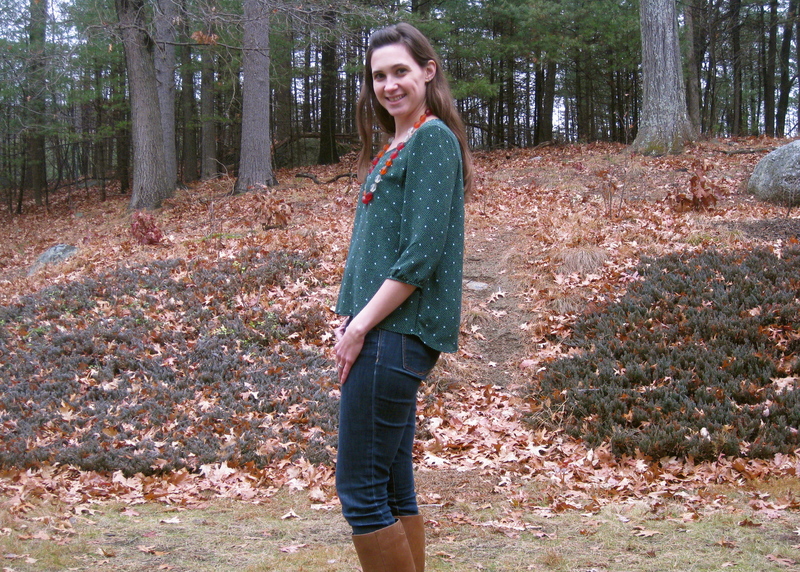 i’m working on organizing my blog a little better. if you are interested in my past makes, up above there is a “what i’ve made” page. there i have, in order, everything i have made this year, and links to the blog post. i planned to do the same for last year’s makes, but since i had switched my blog from blogger to WP, all my old pics are a jumble and nearly impossible to track down. also, i’m trying to make better use of my categories and tags. i’m working my way through all my posts (fortunately it’s super easy to do in WP) and hopefully within a few weeks i’ll have it better organized!